The United States consumption of key raw materials is rising fast. 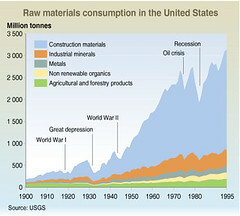 Since 1950 some raw material consumption has increase by over 200 percent. Raw materials used for construction has risen over 400 percent in the same time period.